This volume surveys the economic history of British North America, including Canada and the Caribbean, and of the early United States, from early settlement by Europeans to the end of the eighteenth century. 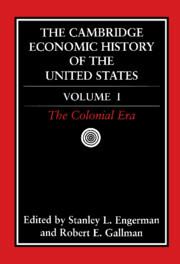 The book includes chapters on the economic history of Native Americans (to 1860), and also on the European and African backgrounds to colonization. Subsequent chapters cover the settlement and growth of the colonies; British mercantilist policies and the American colonies; and the American Revolution, the Constitution, and economic developments through 1800. Preface; 1. The history of Native Americans from before the arrival of the Europeans and Africans until the American Civil War; 2. The African background to American colonization; 3. The European background; 4. The settlement and growth of the colonies: population, labor, and economic development; 5. The Northern Colonies: economy and society, 1600–1775; 6. Economic and social development of the South; 7. Economic and social development of the British West Indies, from settlement to c. 1850; 8. British mercantilist policies and the American colonies; 9. The revolution, the constitution, and the new nation.